NYMTC strives to engage varied stakeholders in dynamic and significant ways – and enhance the level of meaningful input into the regional transportation planning process. NYMTC's Public Involvement Plan (PIP), updated in September 2012, guides the involvement process and includes specific steps and measures to involve stakeholders and ensure that future transportation investments reflect the needs, interests, and concerns of those who are most affected. 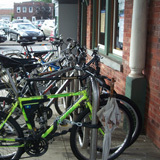 NYMTC actively seeks to involve stakeholders in the development of all its planning products through public meetings and review periods, workshops and webinars, informal brown bag presentations and open houses, its website and social media, and by regularly reaching out to an interested and active public to gather ideas and feedback to find workable solutions to planning the region's transportation future. Join a mailing list, attend a meeting or event, like us on Facebook, request an in person planning overview session for your organization - let your voice be heard! As a step toward a more inclusive planning process, NYMTC's Language Access Program provides translation services for people who are not fluent in English, enhancing our public involvement efforts and increasing the accessibility of information about - and input into - the regional transportation planning process. 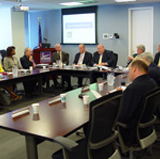 NYMTC is comprised of 9 voting members and 7 advisory members. PFAC oversees NYMTC's day-to-day operations. Three Transportation Coordinating Committees (TCCs) help support planning in the region: NewYork City TCC, Mid-Hudson South TCC and Nassau/Suffolk TCC. 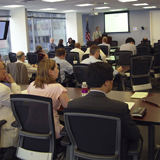 Advisory Working Groups serve as vehicles for stakeholders and the interested public to participate in the planning process, and are open to the general public. The PIP guides NYMTC's ongoing public outreach efforts in the region. NYMTC-Notes offers monthly news and updates.